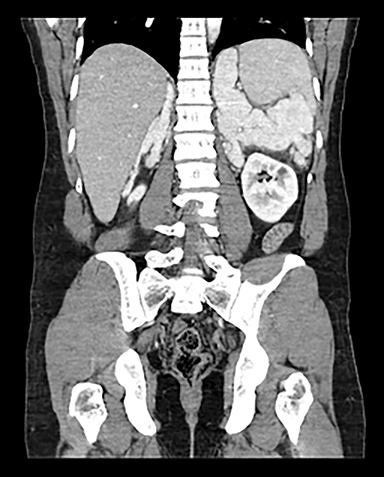 A 35-year-old Hispanic man presented to the emergency department with a two-day history of abdominal pain, non-bilious vomiting and acute anorexia. The patient was previously diagnosed with hypospadias and congenital adrenal hyperplasia (CAH) but has been without treatment for 3 years, due to lack of insurance. Surgical, family and social history were non-contributory. Review of systems was negative, including no weight loss and no fever. Physical exam was within normal limits. Contrast-enhanced computed tomography (CECT) of the abdomen and pelvis demonstrates lobulated homogenously enhancing masses measuring up to 10 cm in the bilateral adrenal fossa (Figures 1 and 2). Most patients with 3-BHSD deficiency will require treatment with mineralocorticoid, glucocorticoid and androgen replacement. The level of 3-BHSD enzyme function can vary in patients with deficient enzymatic activity.1 We postulate that our patient has residual enzyme function, as he was non-adherent to medication and asymptomatic for nearly three years. 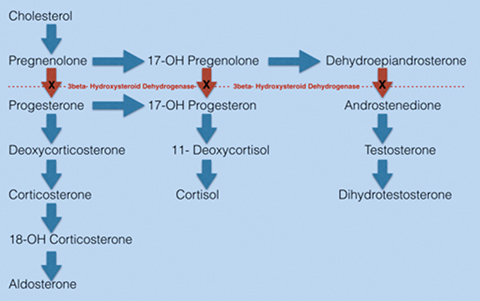 Furthermore, the imaging findings upon presentation likely represent a result of chronic adrenal stimulation and steroid precursor buildup of cholesterol, pregnenolone, 17-OH pregnenolone, and dehydroepiandrosterone (Figure 3).4 The feared complication of CAH is adrenal crisis; a life threatening reaction to low cortisol characterized by hypoglycemia, hyponatremia and hypovolemic shock. Patients with CAH may also struggle with infertility. Imaging findings of adrenomegaly can be seen with 3-BHSD deficiency, a subtype of CAH that leads to deficiencies in mineralocorticoid, glucocorticoid, and androgen synthesis. Although some enzyme function may persist, treatment with fludrocortisone, prednisone, and testosterone is the standard of care. Patients who are withheld treatment risk an adrenal crisis, especially when stressful life events occur. 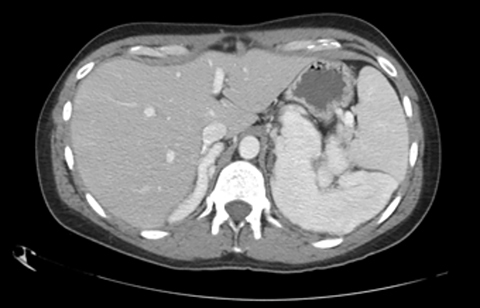 Harinarayana CV, Renu G, Ammini AC, Khurana ML, Ved P, Karmarkar MG, Ahuja MM, Berry M. Computed tomography in untreated congenital adrenal hyperplasia. Pediatr Radiol. 1991;21(2):103-105. White PC. Neonatal screening for congenital adrenal hyperpasia. Nature Reviews Endocrinology. 2009; 5: 490-498. Penny S, Gridley D, Young J. Congenital adrenal hyperplasia secondary to 3-beta hydroxysteroid dehydrogenase deficiency. Appl Radiol. 2017;46(11):46-47. Prepared by Dr. Penny while a PGY-II Radiology Resident, Dr. Gridley while the Chairman of Radiology, and Dr. Young while a PGY-V Radiology Resident at Maricopa Medical Center in Phoenix, AZ.